Show off your favorite party photo or a special 30th birthday portrait with our beautiful Engraved Birthday Personalized Picture Frames. 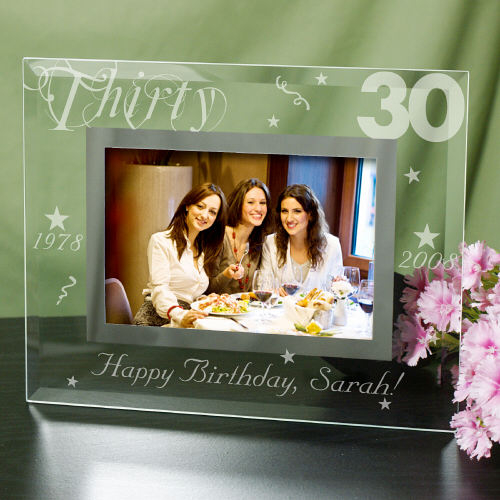 These Engraved 30th Birthday Customized Picture Frames comes in two great sizes. Choose either our 9" x 7" frame that holds a 3.5" x 5" or 4" x 6" photo or our 8" x 10" frame that holds a 5" x 7" photo. Easel back allows for desk display. Includes FREE Personalization! GiftsForYouNow.com has a vast selection of Personalized Birthday Gifts suitable for any special occasion. Whether you are attending a 21st, 40th or 100th birthday party, you are sure to find the perfect Personalized Birthday Gift for Him or Her. We specialize in unique birthday gifts which are going to be remembered and enjoyed for a long time.